An American Legion site links to flag rules how to display the flag, including half-staff displays. These however didn't speak clearly to me on some of the details. How large are the black bows and streamers? When do you quit having the flag at half staff? What do you do about the projected flags? (Is there a half-staff picture for projection?) Can I keep my flag at half-staff when the government has stopped doing so? When the flag is illuminated at night, is the incidental light of a street light adequate? Where half-staffing is not appropriate: for indoor and permanently-mounted flags or outdoor flags on very short staffs. It is recommended an older mode of expressing mourning. 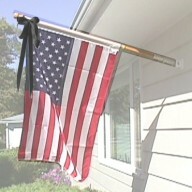 Attach black ribbons to the flag-staff (above the flag but below the finial). 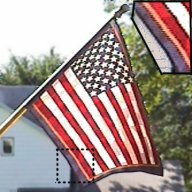 A black ribbon no more than 10% as wide as the flag itself, but twice as long as the flag, can be tied with a knot or bow at its center so that the two resulting parts that hang down are each as long as the flag. On a pole: If you can't lower the flag, hang a bow from the top. On the house: Attach the bow and ribbon at the "point"
Projected: Get the proper slide? Draw a mourning bow on the slide? 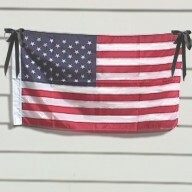 Put a bow on the garage wall and project the flag next to it? Can I keep my flag at half staff? No! Lowering the flag to half staff is a major sign of mourning not to be done lightly. There will be published termination times. For example, flags were at half staff until sunset Sunday, September 23rd, following the terrorist attacks. Wall mounted (& projected) flags. Make sure the stars are on the upper left as you look at it. In the front window--left from the outside. Flags suspended above the street: Make sure the stars are on the east or north side of the street (in Primghar--same side as the even-numbered house numbers). Lighting at night: Lighted or taken in. 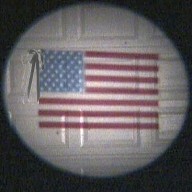 Light the flag so the stars and stripes can clearly be distinguished from a distance. Personally I like the dedicated lights played directly on the flag. A well lighted flag can be impressive. 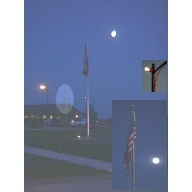 An acquaintance noted how impressive the lighted flag on the bluffs in Sioux City looked. 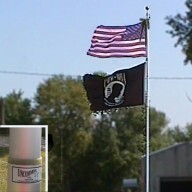 And when I was on the Adair (IA) Fire Department we debated putting a flag in front of the building. Someone pointed out that if we didn't raise and lower it each day we would have to light it. To make displaying it easier we decided to light it. I must say the firemen who installed the lights did a very good job. Flags lit only by street lights leave me wondering whether "the stars and stripes can be distinguished from a distance." That quote was the one standard of adequacy that I found. From Ketchum, Idaho: "Flag Poles - Upward flagpole lighting is permitted for governmental flags only, and provided that the maximum lumen output is 1300 lumens. Flags are encouraged to be taken down at sunset to avoid the need for lighting." From Aspen, Colorado: "Up-lighting of flags is permitted with a limit of two fixtures per flag pole with a maximum of 150 watts each. The fixtures must be shielded such that the point source is not visible outside of a 15-ft. radius." LIGHTED FLAGS The picture shows two flags lighted at night, one with a floodlamp on the ground and a second in the background (and inset) lighted with a focused light mounted on an adjacent street light (smaller inset). Taken on a beautiful, moonlit night just after dusk. Through computer manipulations, the pictures resemble what my eyes saw.Back. Assembled by ovk. Last updated 12/09/2004.